Place rack (or metal or silicone steam basket) in Instant Pot. Carefully place eggs in the Instant Pot on rack. Add one cup cold, warm or hot water to pot. Place the lid on the pot, making sure the rubber sealing ring inside of lid is in place. Place the lid on the Instant Pot, lock into place. 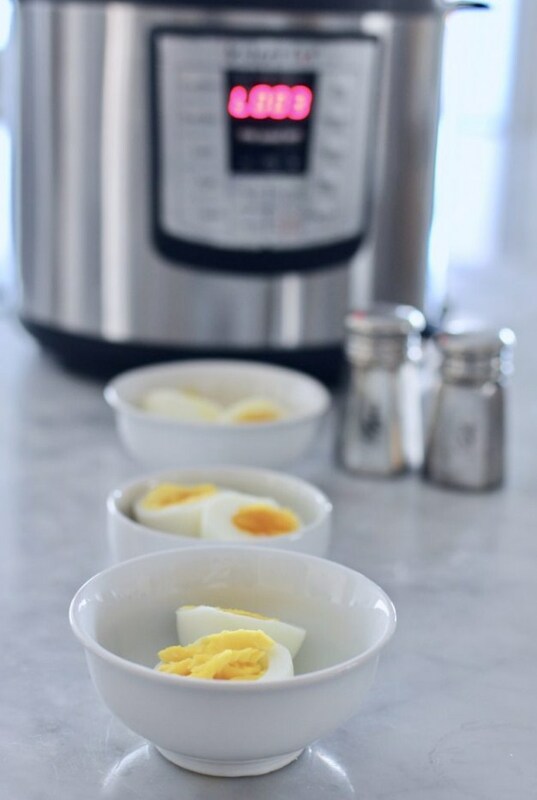 Using the MANUAL setting or HIGH PRESSURE Setting, adjust the timer to 5 minutes for hard boiled, 3 minutes for medium set yolks or 2 minutes for soft boiled eggs. When the timer goes off, carefully release the pressure manually using the pressure release valve. Remove the eggs and set in a bowl filled with ice water. You may also run a stream of cool water over the eggs while in a bowl. If cooking eggs for soft boil, remove and set the eggs in cool water for about 30 seconds to a minute for easier handling, then remove and set in bowl and cut in half with sharp knife. Scoop out the cooked egg, including the yolk into a small clean bowl for serving. -For soft boiled eggs, the eggs will firm up and become less runny (including the whites) as they sit. Do not leave in cold water bath for longer than a minute or eventually the egg yolk will become completely firm. -The eggs peel quite easily when submerged in cold water or an ice bath. I simply place the eggs in a bowl in the sink and run cold water over in a small stream for about a minute. -No matter the amount of eggs, 4 or 12, I use 1 cup of cold water.